Arc flash hazard labels must be placed on any piece of electrical equipment where workers might need to perform work while the equipment is still energized. This typically includes equipment such as panelboards, switchboards, and meter socket enclosures. Note: NFPA 70E makes an exception for some labels created before September 30, 2011; as long as these labels contain the available incident energy or the required level of PPE, they do not need to be changed. The arc flash boundary refers to the distance from an arc flash hazard within which a person would likely receive curable second-degree burns if an arc flash occurred. This is determined using the location where the incident energy is equal to 1.2 cal/cm2. Incident energy is the amount of energy impressed upon a surface at a given location. It is a function of the system’s voltage, the available short-circuit current, the arc current, and the time needed for circuit protective devices to open. Calculating the incident energy at the location where work will be performed (usually 18”) can also help determine what PPE workers need to wear to stay safe. Hence, the label must contain this information. To fulfill this requirement, the label can contain the available incident energy at the location where work will be performed OR the PPE Category (as determined by the tables in Article 130.7 of 70E), the minimum arc rating of clothing (which is determined by the manufacturer and appears in the clothing or gear’s tag as the Arc Thermal Protective Value (ATPV)), and/or a list of specific PPE required by your worksite. Keep in mind that the main goal of an arc flash hazard label is to alert employees to a hazard and provide them with the information they need to select PPE and perform work safely. Label format should conform to the ANSI Z535.4 Products Safety Signs and Labels standard requirements, which include the WARNING or DANGER signal word and corresponding colors, symbols, and text. Generally, WARNING (with an orange background) is used for arc ash labels to indicate a serious hazard exists. The term DANGER should only be used when a life-threatening situation is imminent; sometimes businesses use DANGER when the incident energy is higher than 40 cal/cm2. 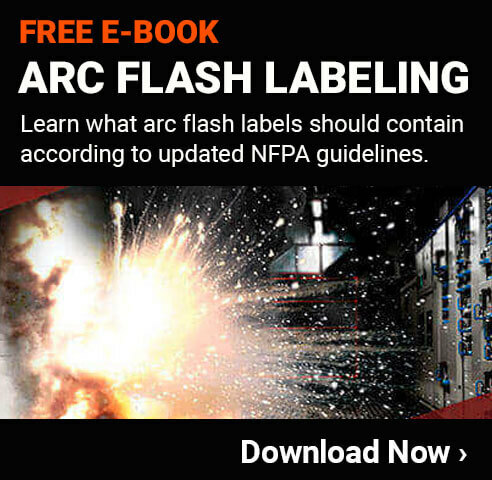 The sample label below is one option for presenting arc flash information using ANSI label guidelines, but it is not the only option. 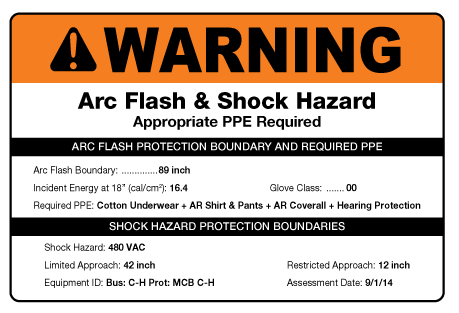 Many workplaces choose to include additional information about shock hazards on arc flash labels so all electrical hazards are covered. This sample label contains pertinent shock information. An approach limit located at the distance from exposed live parts within which a person could receive second-degree burns if an arc flash occurred. Needed Arc-Rated (AR) protective equipment designed for specific parts of the body is listed here. Incident Energy is a measure of thermal energy at a working distance from an arc fault (measured in cal/cm2). The working distance is the distance from where the worker stands to the flash location (commonly 18 inches). The Arc Flash PPE Category is determined by consulting the PPE tables in Article 130.7 of NFPA 70E. PPE categories range from 1 to 4 (with four having the highest incident energy rating and requiring the most protective gear). PPE Category is not depicted on this sample label because the available incident energy and corresponding work distance are listed. Both cannot appear on the same label. Shock Hazard, measured in VAC, is a dangerous electrical condition associated with the possible release of energy caused by contact with or approach to energized parts. This number also represents the nominal system voltage and could be labeled as such. is broken down into six classes. Class 00 is the least protective, while class 4 provides the most protection. The Limited Approach Boundary indicates where an electric shock could occur. It should be entered only by qualified persons or unqualified persons that have been advised and are escorted by a qualified person. A heightened risk of electric shock exists inside the Restricted Approach Boundary. Only qualified persons should enter this space. Requires the use of shock protection techniques and PPE. Arc flash risk assessments must be reviewed at least every 5 years or when a major modification occurs. Including a documented date is helpful for this reason. While the Limited Approach and Restricted Approach boundaries listed on the sample label do not apply directly to arc flash, it is helpful to see where these boundaries are located. Any workers who must enter these boundaries should receive appropriate training and wear required protective equipment. Depending on the situation, the arc flash boundary can be located inside or outside the limited approach boundary.